QuickBooks classes are typically full of attendees either wanting or being forced to take charge of their practice’s accounting. The back rows fill up first with those preparing for a quick escape. Some think the class will be boring because, in their minds, people that love accounting must be boring and thus become boring accountants who teach boring accounting classes. Au contraire, QuickBooks for dental managers is an amazing financial, organizational tool [insert geek smile] (and that’s not just my inner geek speaking). Truth be known, I hate accounting, but I love organizing my (and everyone else’s) income and expenses to see how the business compares from this year to last. In some ways, living in the information age has made financial organization difficult to track. In other ways, it has made this easier. But making sense (or cents) of it all is a whole different story. Whether speaking to an audience or having a phone call, these three questions seem to be the ones I’m asked most often. So, grab your coffee, a snack, and let’s organize your finances! 1. What about QuickBooks Online? QuickBooks Online is often encouraged by a CPA for its easy access, but I do not believe it is the best product for a practice. Let’s compare the middle QuickBooks Online option, Online Essentials, with my recommendation, QuickBooks Desktop Pro. Cost – I recommend the QuickBooks Desktop Pro version be upgraded only every three years. Comparing cost, the QuickBooks Desktop Pro version can be purchased for an average of $199.00 vs. $1380.00 for the Online version (3 months with a 50% discount, then $40 per month.) That is the current pricing. Everyone expects QuickBooks Online to increase pricing steadily over the next few years. For me, that’s a no-brainer. Other Names – For all the faults of QuickBooks Online, this is one of its strongest shortcomings: there is no Other Name payee type. This is the convenience store, Starbucks, Costco, pizza delivery, airline, hotel, gas station, restaurant, etc. Practices typically use the Other Name to record expenditures from continuing education, dental office manager study clubs, referral gifts or business dinners. It is important for businesses to separate these types of payees, to more appropriately review the Expenses by Vendor Summary. Not separating them convolutes the ability to examine the report, leaving the door open for the inability to review relevant expenses to the practice. Reports – The report customization is extremely limited in QuickBooks Online. At this writing, the Chart of Accounts can only be arranged alphabetically by account type. Your Chart of Accounts is the most important aspect of your QuickBooks use and the way you review reports is based on its design. The ability to customize and rearrange your Chart of Accounts is restricted to the QuickBooks online template. The design of the QuickBooks Online product has gone backward. Speaking of reports, there are over 100+ reports in QuickBooks Desktop Pro, with only 40+ reports in the Online version. And, again, most QuickBooks Online reports are not customizable. Accessibility – I marvel at the assumption that QuickBooks Online is the only way to access QuickBooks via the Internet. Trust me; there are other options. GoToMyPC ($23/month) allows a user to access their entire computer remotely, while iNSYNQ, an online service, hosts the full QuickBooks version in the cloud. While there is a cost involved, if you need remote access, this is your most appropriate option. Converting back to QuickBooks Pro – Some users have not yet been warned about a critical issue with QuickBooks Online. Downloading an online copy to convert back to QuickBooks Desktop Pro is problematic. While QuickBooks Desktop Pro converts nicely to QuickBooks Online, the reverse is not true. QuickBooks Online requires additional measures, such as printing copies of the Balance Statement and cross-examining reports, to securely transfer all your data to QuickBooks Desktop Pro. Very few Advanced QuickBooks Pro advisors recommend the Online version for the reasons above. If your practice is contemplating a move to QuickBooks Online, please email me first and let’s discuss your options. 2. What’s the advantage of QuickBooks full-service payroll option vs. My Cpa, Paychex, ADP or other payroll providers? ADP, Paychex, and others (CPAs) offer to pay your employees by check or direct deposit. Typically, the employee’s hours are calculated, hopefully, reviewed, and either called into the payroll service or entered on their website. The payroll company pays the payroll taxes, files the payroll reports and creates the W-2s at the end of the year. Due to the monies being withdrawn from the practice bank before processing, these amounts must be manually entered into QuickBooks as three lump sums if direct deposited or individually entered if checks are printed. The practice’s QuickBooks is left without detailed information of the paychecks, and must always defer to the actual payroll service’s website or printed reports to answer any questions regarding a paycheck. And if the amounts are only entered into QuickBooks as lump sums, the amounts applied to Withholding, Social Security, or Medicare cannot be accessed. Well, guess what? Intuit has a full-service payroll option online. Enter the employee hours, create the checks, download all the detail into QuickBooks and let Intuit do the rest. Plus, if you go to my website and click the Resources tab, you will find an Intuit contact that will give you a 20% discount and free setup for switching. 3. Can’t I just download all my transactions into QuickBooks without entering the checks or deposits in the QuickBooks register manually? Sure, you can, but that’s not the wisest management move. Manually entering deposits, then downloading, ensures you are paid exactly what the practice software says you should be paid. It is a check and balance to an already complicated system. I will always advocate for back-to-back accountability between QuickBooks and the practice software. The end-of-day procedures include printing the daily deposit report, credit card summary and patient payment plan report; batching out the credit card terminal, and creating a bank deposit slip. Staple the credit card summary, and a copy of the bank deposit slip to the back of the daily deposit report, hand the physical deposit and the reports to the doctor, and you’re done. Once per week, enter these amounts individually into QuickBooks as they are deposited into the bank: cash & checks, MasterCard, Visa, Discover and American Express, patient payment plan (funded amount – discount fee = deposited amount), electronic insurance, etc. Then, when you download, the amounts match! I have been encouraged to see practices take ownership of their accounting and experience positive outcomes. It is not that hard—seriously! Have a thirst for QuickBooks knowledge? 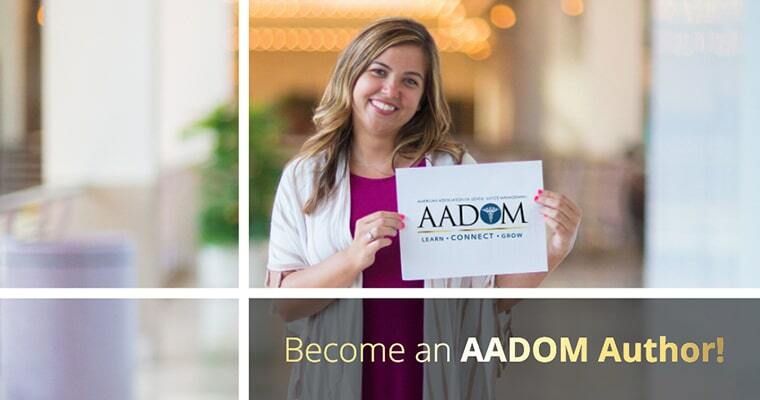 Quench that thirst at the AADOM Annual Meeting in San Antonio this year with some dental management further education opportunities. We will address the best practice procedures for using QuickBooks. Join us for another robust class where your questions are answered! 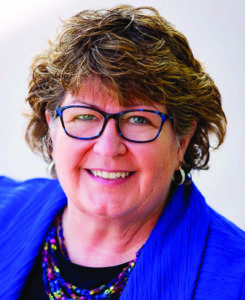 Susan Gunn is the financial organization expert and thought leader for professional practices, providing solutions to maximize QuickBooks beyond tax accounting. 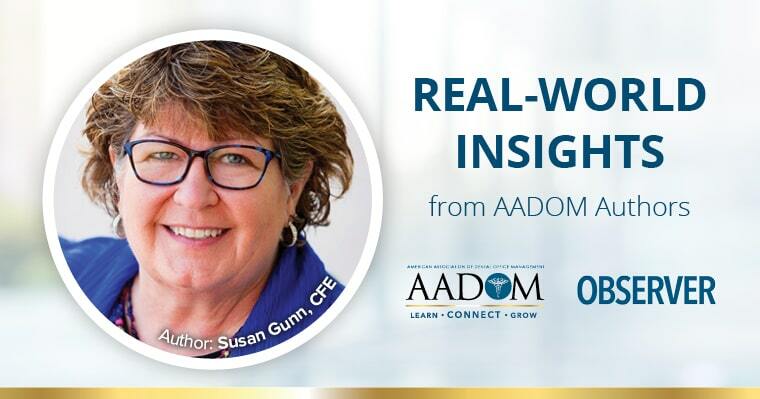 A nationally recognized conference and study club speaker, Susan shares relatable stories, expertise, humor, and down-to-earth, practical advice. Susan views speaking as a means to disseminate critical information, passionately standing alongside the audience in whatever she is addressing: embezzlement, finances, ethics, leadership, or caregiving. As a Certified Fraud Examiner, Susan provides evidence for prosecution and/or civil suit purposes in embezzlement cases, and then provides systems and procedures to protect the practice’s future. She is the author of QuickBooks In Your Practice (1997-2017), Advanced QuickBooks In Your Practice (2004-2017), More Than Just Turning It On (2000), and Matters of the Heart (2016). Susan co-authored The ADA Practical Guide to Expert Business Strategies (2014) and contributed to ADA Guidelines for Practice Success Managing Finances Best Practices (2016). To learn more about Susan and how she can help you and your practice, visit www.SusanGunnSolutions. com.